Angie Smalis, dancer with Daghdha dance comnpany, has a performance entitled Dances Solo(s) on Saturday 20 May at 2.30pm. 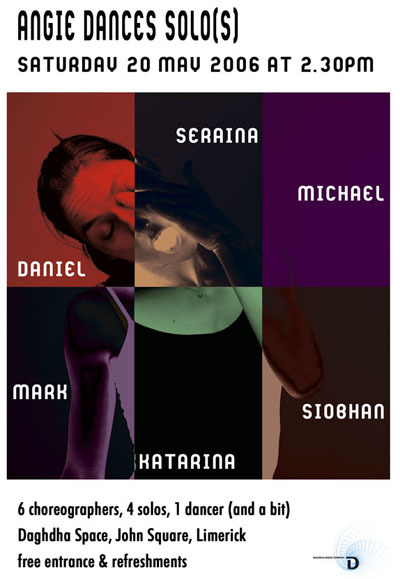 Six choreographers have contributed four different works. As usual the event is at Daghdha Space, John Square, Limerick. Admission is free and refreshments will be provided. This is perhaps the last time you can see Angie in Limerick, as she is soon moving back to her native Greece. Show up to wish her well! I am happy to have designed the poster for this show.